A big thank you to Audrey for sending me a review copy! I was intrigued by the idea of a Peter Pan retelling. Confession: I've only seen the movie versions (Disney's animated and the Jeremy Sumpter live-action), but the idea of a magical island full of adventure and no grown-ups--what kid, or teenager, could turn that down? Cue this book! 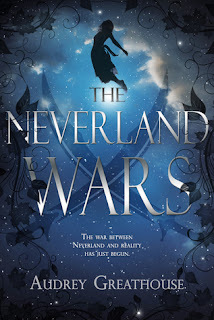 The Neverland Wars is a Peter Pan-inspired tale that takes Peter's original fight against aging and turns it into a full scale war against all the adults who monopolize magic and don't give kids a choice about whether to grow up. Gwen, the protagonist, has just learned magic exists and is trying to cope, first with her little sister's disappearance, then with the reality of Neverland--all while trying to navigate the transition between childhood and adult, questioning whether growing up means leaving everything childish behind. The Peter Pan she meets is older than the book version and more driven and focused. He has the traditional playful spirit and boundless confidence, but he has a purpose; he's a boy at war. Gwen's sister, Rosemary, and the other lost children are a little too good-natured and angelic. I babysat my neighbor's kids for eight years, starting when they were 3, 2 and 1. Unless these kids are on some sort of Neverland crack, there should be WAY more trouble in paradise. Children left to their own devices do not live a Utopian existence, even, or especially, with a leader like Peter Pan. See Lord of the Flies. Overall, I think the plot would have flowed more smoothly if the author limited Gwen's introspection/internal conflict and added more tangible scenes focused on the war, the relationship with her sister, or even on the relationship with Peter. The medicine woman's and mermaid's prophecies hint at big things to come, but I wish we had seen more of it now. There is a little too much teen angst and philosophical self-reflection for my taste, and Gwen settles on very few answers. I'm interested to see how the whole prophecy thing plays out. (It promises trouble down the road and some sort of romance. I have theories.) However, I would probably need a friend's confirmation that the narration flowed more consistently before picking up the sequel. I'm glad to have introduced a Peter Pan fan to a new retelling. Hope you love it! And how could I forget Mary Martin as Peter Pan?! We had a VHS of that growing up and I still remember half the songs. Although, I think it was filmed on the 10th anniversary of the play or something, so everybody looked WAY too old for their parts, lol.